There are several possible Gaelic origins for this name, but the most likely appears to bebheathain, meaning lively one. This could also have been rendered as MacBheatha?, or Macbeth. The earliest certain record of the name appears in an old Kinrara manuscript of the mid fourteenth century, which names both Bean MacMilmhor and his son, Milmor Macbean. The Macbains supported Robert the Bruce in the struggle for Scottish independence, and they are credited with the killing of the steward of the Red Comyn, whose master had been stabbed to death by Bruce himself in the Greyfriars Church at Dumfries in 1306. They fought at the Battle of Harlaw in 1411 along with the rest of the Chattan Confederation on the side of the Macdonald Lord of the Isles. In the history of Clan Mackintosh it is recorded that ?the Mackintosh mourned the loss of so many of his friends and people, especially of Clan Vean?. Paul Macbean, the twelfth chief, was weighed down by heavy debts and was forced to relinquish his lands around 1685. The loss of the lands of the clan at Kinchyle must have been sorely felt, but happily the present chief has continued the work of his father, who retrieved some of the clan lands and established the Macbain Memorial Park on the slopes above Loch Ness. 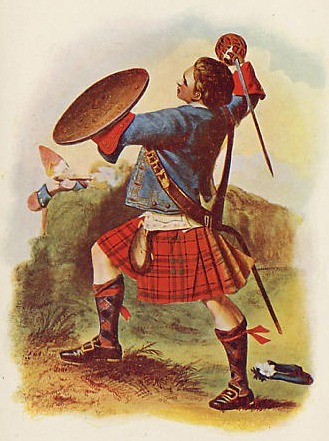 In 1746, Gillies, grandson of the twelfth chief, a giant of a man said to be at least 6 feet 4 inches, saw government dragoons breaking through to assault the Highlanders in the flank. The major threw himself into the gap and, with his back to the wall, cut down thirteen or fourteen of his assailants until he himself was mortally wounded. A Hanoverian officer called back his men in an attempt to save a brave fellow soldier, but Macbean was already dead. It was a Macbain who commanded the Gordon Highlanders against the Boers of South Africa in 1881. In this century the chiefly line has flourished, first in Canada and now in the United States. Septs of Clans: Bain, Bayne, Bean, Beattie, Binnie, Binning, MacBain, McBain, McBean, MacBane, MacBayne, MacBan, MacBean, MacBeath, MacBeth, MacBheath, MacIlvain, MacIlveen, MacVain, MacVane, MacVanish, MacVean. MOTTO: "Touch not the catt bot a targe"